I combine hand-woven textiles, manipulated fabrics and acrylic, coloured light, still images and video projections to create eye-catching sculptural installations with constantly changing light, colour, surface detail and movement. Lately I have worked more with paper based mediums, photography and digital imaging. Much of my inspiration has been taken from the surrounding landscape: clear skies, wind, water and the land. Layering, reflection, transparency and illusion are evident in all my work regardless of the medium. 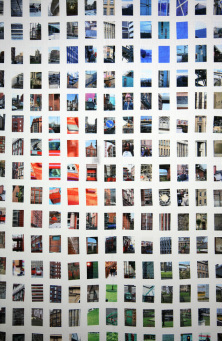 Since moving to Newcastle in September 2008 the urban landscape, fashion and museum collections have informed my work. My work is constantly changing; each piece evolving from the last, always challenging techniques, researching new materials and using unusual combinations of art forms. I accept commissions for textile installations, acrylic sculpture, drawing and painting, digital art and photography. International clients have included Det Norske veritas, Stolt offshore Ltd, Acergy, BP and Infosto (Finland).